Bear had time to join me for dinner tonight. Meaning, that for once he wasn’t on the road. So while waiting I tried to put together dinner. 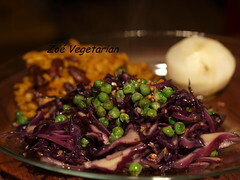 And here’s what’s new: Indian spicy red cabbage and pea (which is usually done with a green cabbage) and caramelised turnips. The spice of the cabbage and pea dish is calmed down with the sweet turnips. 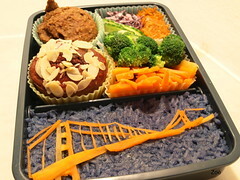 Rice and red beans were added to balance the meal. I set the table with a nice cloth, the Sunday plates, and lit a few candles to make it a little special. -Bf’s cheese sandwich and Brussels sprouts. It’s the first time I find quail eggs in the nearby shop. I couldn’t resist trying them. 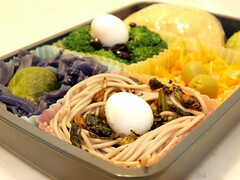 I had in mind a eagle’s nest made with soba noodles and some green sprinkles which should be quite flavoured to highlight a bit our cold lunch. I had prepared some flavoured greens to go with them and was trying to present it not to awfully, when Bear came with the idea of doing 4 nests and adding olives to the last nest. 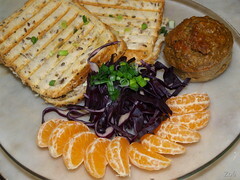 -Flower made with raw red cabbage, carrot, parsley stalk and mushrooms. 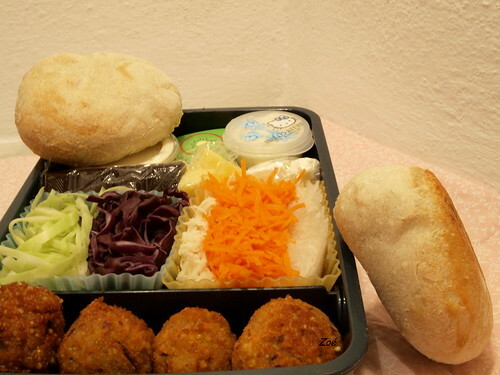 -BF gets mini cheese sandwiches. 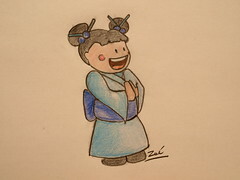 Lately I was in a creative mood. 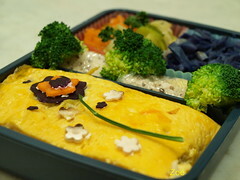 I wanted to colour a bit our bentos and I had this pattern in the mind: a yellow omelette with a flower to remember that Spring will somehow knock at the door and fight back the snow and the grey skies. Because most time the kyaraben don’t resist travelling I’ve glued each element with cheese spread. 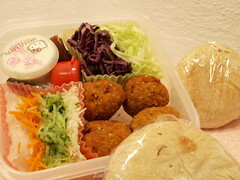 Therefore, when we opened our bento at lunch time, the flower pattern was still prettily there. As usual, there’s such a different between what I have in mind and how I poorly manage to present them. This croque-monsieur is just a vegetarian sandwich grilled in a George Foreman-style grill. I’ve put inside this vegetarian pâté I received, a radish spread, some sliced mushrooms and a piece of Polish cheese whose name his quite misleading: ser salami. Nothing to do with salami it’s only a cheese really similar to Gouda I would say. Well, I’m just killing time…he’s sleeping. Tonight, I’ll offer him a French-Polish dictionary, the side effects when using it to try to speak Polish are less obvious than Wodka!